The long wait is over for Tai Kwun Centre for Heritage and Arts, the landmark venue in Hong Kong’s former Central Police Station compound, which partially opened on 29 May. The Jockey Club—the city’s biggest philanthropic organisation—and the Hong Kong government announced plans for the ambitious development, designed by Herzog & de Meuron, more than a decade ago, in October 2007. Construction began in late 2011 and has so far cost HK$3.8bn ($484m). On 8 June, the centre’s visual art strand, Tai Kwun Contemporary, will open two exhibitions in the 1,500 sq. m galleries: Dismantling the Scaffold, an international group show organised by the curator Christina Li on behalf of the local non-profit Spring Workshop, and a project by the young Hong Kong artist Wing Po So, presented by the MFA programme of the Chinese University of Hong Kong (both until 15 August). “Tai Kwun Contemporary is the missing piece in the puzzle,” says Tobias Berger, the centre’s head of arts. The Hong Kong art scene has expanded “mainly on the commercial side” in recent years, he says, citing the arrival of the Art Basel fair followed by outposts of major international galleries. “We have not seen the same growth in the non-profit scene,” Berger says, though this is set to change with Tai Kwun and the M+ museum of visual culture, another Herzog & de Meuron project, which is scheduled to open in late 2019. “Hong Kong will become a great centre for contemporary art,” Berger predicts. As well as drawing the public, the new venues will benefit local artists, he says, by offering more and better opportunities to exhibit and to see exhibitions. Tai Kwun will be “the important link between the smaller non-profit scene and the rather established museums” in the city. The new venue’s relationship with M+, where Berger served as curator of visual arts from 2011 to 2015, is complementary and “very friendly”, he says. As construction continues on the museum in the sprawling West Kowloon Cultural District, its M+ Matters talks series will pop up in Tai Kwun’s auditorium. In the future, Berger imagines the two institutions to be like London’s Serpentine Galleries and Tate Modern or the New Museum and MoMA PS1 in New York. With its smaller footprint and no permanent collection, Tai Kwun “can be more flexible and experimental”, he says. The full police station compound, overseen by Timothy Calnin, a former manager of the Sydney Opera House and the Hong Kong Philharmonic Orchestra, encompasses a 200-seat performing arts centre, an outdoor theatre, restaurants and “many public spaces that we can use for public art”, Berger says. 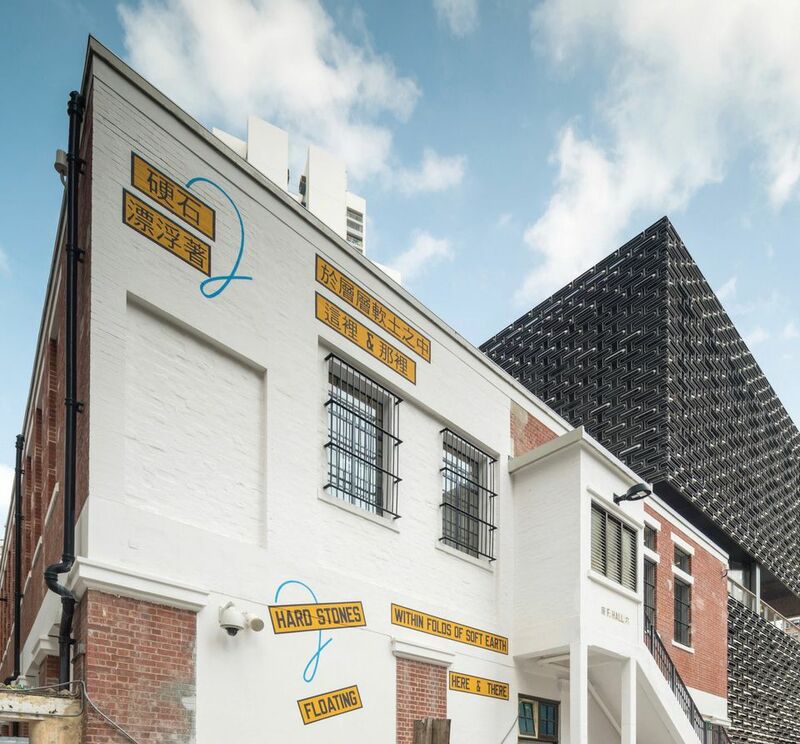 Lawrence Weiner, Izumi Kato, Gaylord Chan and Nadim Abbas have all created installations for the prison yard and there will eventually be an artist residency programme. Tai Kwun plans to stage six to eight exhibitions a year. The first two “are a good forecast of what we are doing,” Berger says. Dismantling the Scaffold mixes big international names such as Marina Abramovic and Superflex with “many Hong Kong artists, of all ages”. Wing Po So, meanwhile, is getting her first major solo show. “Tai Kwun Contemporary is a Hong Kong institution, so we will emphasise Hong Kong artists and focus from there on the Pearl River Delta and East Asia,” Berger says. The programme is heavy on new commissions, “which I always thought should be the main focus of institutions like us”, he says. Curatorial collaboration, locally and internationally, will be another Tai Kwun trademark. However, Berger stresses that “each exhibition is tailor-made for the Hong Kong context—we will not become a pit stop for travelling exhibitions”. As well as a home for contemporary art, Tai Kwun is a heritage site, with three of its 16 original colonial buildings declared historic monuments (the former Central Police Station, Central Magistracy and Victoria Prison). After the Central Police Station was fully decommissioned in 2006, the Hong Kong Jockey Club appointed Herzog & de Meuron to revitalise the 13,600 sq. m compound and add two new buildings: the JC Contemporary exhibition space and JC Cube performing arts theatre. Tai Kwun’s planned opening in late 2016 was postponed after a wall collapsed in the Married Inspectors’ Quarters that May. The building will now be unveiled in the third phase of Tai Kwun’s staggered opening, though no date is confirmed.